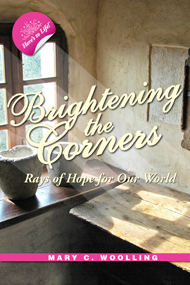 Brightening the Corners: Rays of Hope for Our World is a collection of vignettes inspired by feelings and experiences close to home, all viewed with a positive and cheerful outlook. An engaging raconteur, author Mary C. Woolling focuses on the abundant goodness to be found in every nook and cranny of your metaphorical house of life. Through sunny thoughts and glowing optimism, she offers comforting beams of light to brighten your way. Mary hopes not only to brighten your corners, but also to illuminate your mind. She encourages you to capture in writing your personal story. Included within are multiple journal pages for you to record your thoughts and inspirations triggered by reading these essays. Through journaling, we gain clarity of vision and purpose. We also achieve greater understanding of ourselves as well as those in every corner. In our troubled and hurting world, a light in the window and a crackling fire on the hearth may be more important than we ever imagined, perhaps even serving as common ground from which to promote understanding, harmony, and world peace.